“God loves the Trinity (in the “three of something” sense) — a Russian proverb. This entry was posted in weapon and tagged armor, Bulletfest2015, camouflage, tank, WW2. Bookmark the permalink. Trinity is what they called captured Pz-3’s redesignated as the T-III. Something’s not right with that. It’s hard to tell form the angle, but the road wheels are too big and too few and the track type is incorrect for a Panzer III. Some of the armor angles are off, too. 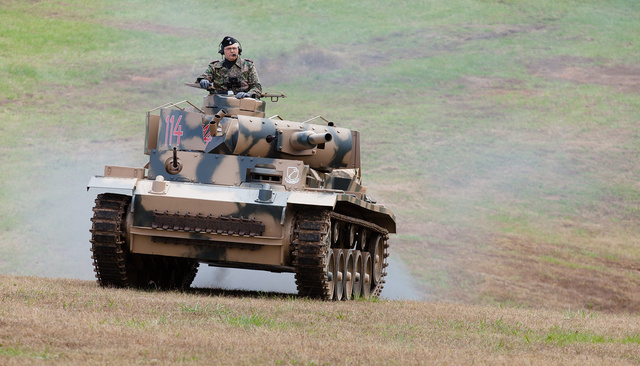 It looks like a replica built on an M18, M24, or maybe an M41 or M42 chassis. Any way to confirm who built that and on what chassis? Vismod based on a Brit FV432 Chassis. A lot of the Vehicles you saw on Band of Brothers were 435 modded to look like Sturmgeschutz. The Jagdpanther was based on a T55 chassis I’m guessing.